Several news sources are reporting today that an often-seen player around the poker tournament circuit has been arrested by the FBI. The story surrounding the arrest will intrigue the poker community. It involves allegations of illegal celebrity poker games, a Russian mob involvement, and a player many of us have competed against, who has won over $1 million at tournaments. The person alleged to have helped facilitate the games, frequented by “millionaires and billionaires,” is Vadim Trincher. The 52-year-old is said to reside in a $5 million apartment in the Trump Tower, immediately below Donald Trump himself. Trump is not reported to be involved. Trincher is also alleged to have threatened with torture poker participants late in paying. To me, torture seems a bit extreme and should be reserved for people who cheat at poker. But that’s just my take on it. 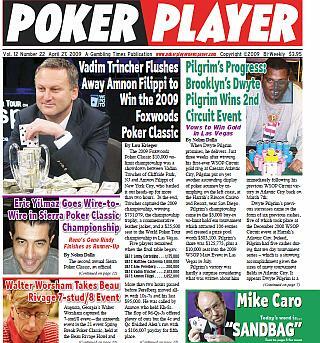 My column always starts on the cover of Poker Player newspaper. So, what? Well, I’ll tell you so what. I see that the accused Vadim Trincher shared one of those covers in 2009 (see image above). He was the most-prominent headline story, having won the Foxwoods Poker Classic main event, worth $731,079. Comparing our photos, you’d probably conclude I was the bad guy and he was the good guy. And maybe he is. Innocent until proven guilty and whatever else. If you want details of his win, as reported by Poker Player in 2009, Click here.